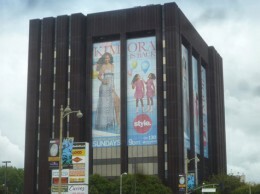 Supergraphics on building at 4929 Wilshire Blvd. A third face is covered with a statue of liberty image. Back in October, we asked the question–What will be next?– for a Wilshire Blvd. office building displaying a multi-story supergraphic image of the Statue of Liberty, the calling card of Michael McNeilly, self-proclaimed artist and owner of Skytag, Inc. That question was answered last week by the appearance of supergraphic commercial ads for a Style Channel TV program on two faces of the building. See related article here and here.